Today I turn the wicked awesome 23's, not so wicked by it's number, but the fact that it is, in fact MY birthday and I got to celebrate it with great friends and a fantabulous Mr. Kilt. Woooo! I happen to be lurking around Stockholm, Sweden at the moment and met an old classmate of mine who... Well, he prints things. Yes, it does indeed say ThatDamnCat. Yes, there is a cat on it. Yes, it is pure awesomeness! ... And no, my piercing is not crooked, the smirk just makes it look that way. 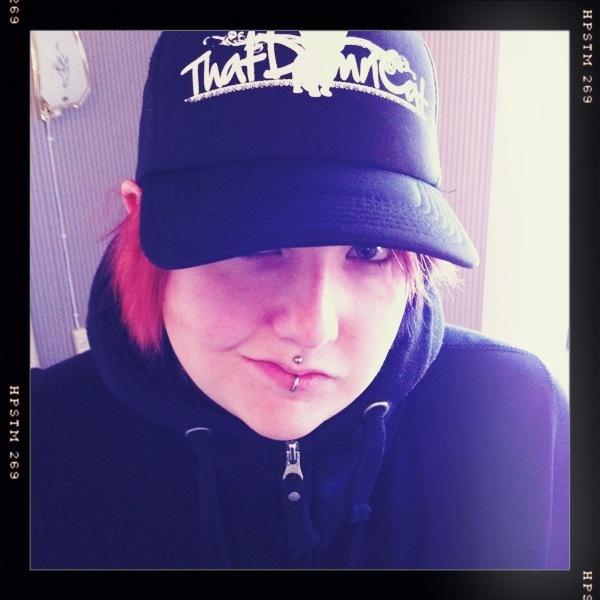 Seriously people, check my friend out on facebook; "Teefromsthlm". I can't describe how utterly happy I am with this print! Going to bed to pass out now, A day of Utter Awesomeness do take an Epic amount of energy. LOOOOOOOVE the hat....it's wicked aaawwwweeeeesome.......and Happy Birthday Day!